Summary: Hélène is an outsider at school. Abandoned by her so-called friends and mercilessly teased by them, Hélène finds some solace in reading Jane Eyre by Charlotte Bronte. She is dreading attending a class camping trip when she has no friends, yet she has to go. While Hélène is there she is so lonely she tries to befriend a fox, but it is a girl named Geraldine who manages to bring the outcasts of Hélène’s tent together to create new friendships. Hélène realises that plain girls like Jane Eyre deserve love too, and perhaps she doesn’t need to believe what the mean girls have been saying about her. Review: I’m breaking my own rule. When I read teen books, I like to have a very specific age range for readership. But Jane, the Fox & Me defies such restrictions. I loved it, and I’m 31. But I could easily see a pre-teen loving it too, or an early teen, or even an older teen reminiscing. It’s an elegantly illustrated graphic novel that I want to just keep on my shelf so I can pull it out and look at the drawings every now and again. They are exquisite in their simplicity and sparse use of colour. Truly a masterpiece. As for the story, for such a brief tale it has a lot of depth. I loved Hélène’s journey, and could identify with how the words of bullies can balloon in your head to take on gigantic proportions. Jane Eyre is my favourite adult classic novel, and the juxtaposition of Hélène’s story with Jane’s was thoughtfully done through graceful writing. I loved how Hélène took inspiration and hope from Brontë’s character in the end. It is a very quick read, but quite a memorable one about finding true friendships and building self-esteem. I do have some quotes from this book, but I encourage you to read and experience the book in its entirety for yourself. You won’t regret it. 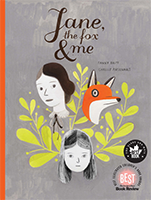 Jane, the Fox & Me by Fanny Brit & Isabelle Arsenault is published by Groundwood Books (first published in 2012, translated into English by Christelle Morelli & Susan Ouriou in 2013).